Space Rocks is a rip-roaring rocket ride of poems, limericks and ditties all set in outer space! Ian Billings and Chris White have created this selection of hilarious verses and rhymes for your iPad, iPhone or iPod touch. But that's is only half the story! All Space Rocks titles come with bright, colourful illustrations to complete the listening and reading experience, with lots of fun along the way. ★ Space Rocks titles are presented as virtual books. Ian and Chris read the poems aloud as the text appears. Sentences are highlighted as the poems progress, making the words easy to follow. ★ Space Rocks is perfect for bedtime listening or on a long journey. Not only that, but there is a "read it myself" mode too which turns the voice off. Young readers can then use the app as a regular book to advance the pages at their own pace. All Space Rocks titles are a pure listening experience for children, as well as a read-along experience for those who are learning to read. 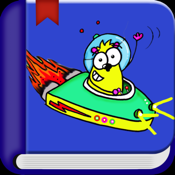 ★ Best of all, Space Rocks comes with a free book of poems and limericks! You can safely purchase more titles in the collection using your iTunes account. You can sample the first few pages of each title completely free of charge and once you have purchased a story, it can be retrieved on all devices associated with your iTunes account.